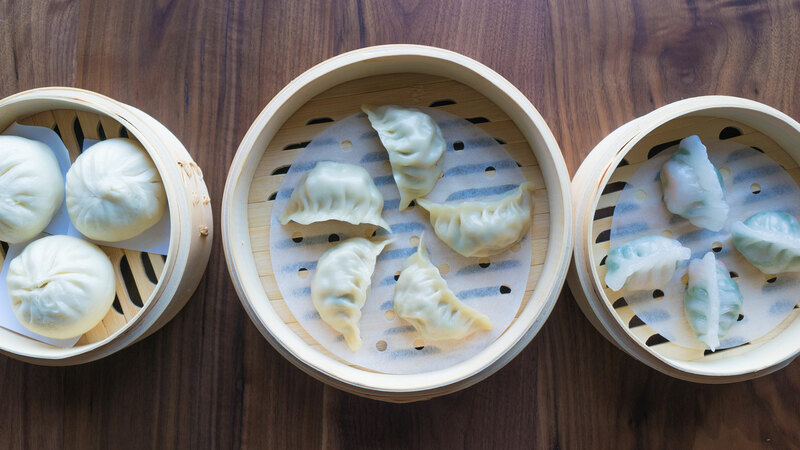 Dumpling Time, the San Francisco hot spot that Omakase Restaurant Group opened last week, is a “filling-forward” modern Asian restaurant with a glorious dumpling obsession. On the menu, you’ll spot spinach-skin seafood gyoza and har gow filled with shrimp and pork, every piece hand-rolled. Even the sauces, tailored to each dumpling, emphasize the fact that this is not your typical dumpling joint. The cilantro har gow are served with a garlicky Asian pesto featuring ginger, cilantro, scallion, spinach, oyster sauce and black peppercorns. The seafood gyoza benefit from both the creaminess and spiciness of a chili-butter sauce, which Agbayani says was inspired by shrimp scampi—it’s a traditional beurre blanc enhanced by togarashi. Other culinary minds behind Dumpling Time include dumpling chef Do Leung (formerly of Tai Wu in Millbrae), as well as the mothers of both owner Kash Feng and Omakase executive chef Jackson Yu. The result of their extensive recipe-testing is a wide-ranging menu that includes a spectacular highlight: pork belly xiao long bao, which are fatty, soupy and delightful to slurp. There are also Xi’an pork dumplings (a hybrid of recipes from Feng and Yu’s moms) that Agbayani garnishes with herbs, chilis and halved cherry tomatoes. Beyond dumplings, Dumpling Time serves delightful Beijing noodles with pork, green onion, ginger and soybean paste. After consuming a dizzying number of dumplings before our noodles came, we were ready to mix things up. We put some chili sauce and some of the vinegar that came with our xiao long bao into our bowl of noodles. And then we slurped.